Gooey cheese or chocolate fondue made in special fondue pots is a tempting treat. Whether made as a main course, appetizer, or dessert, fondue elevates the simple to the sublime. Fondue has an amazing history. The earliest recorded instance of fondue is actually found in Homer's epic poem, the Iliad. For centuries, the Swiss have enjoyed fondue served from the caquelon, or fondue pot. The word fondue comes from the French word fondu, which means "melted" or "to melt." Fondue began not as a luxury food but as a necessity. The Swiss made cheese in the spring and summer but had to make it stretch through the fall and winters. Bread, often made just once a week, became stale and hard. The enterprising Swiss cooks learned that by mixing tough, aged cheese with wine and other materials and heating it gently they could make a rich, warm sauce. Stale bread was chopped up and speared onto forks. When dipped into the cheese mixture, it softened the bread and made it palatable. Thus was born fondue. While traditional fondue is made from cheese and wine, today's fondue twists include chocolate fondue and even fondue fountains found at wedding spouting chocolate sauce over tiered trays. Swiss: Made from one or more traditional cheese such as Swiss cheese, Emmental, or Gruyere cheese. It can be mixed with herbs, spices, and vegetables such as tomatoes and peppers, and infused with wine. French: French fondues are based on Swiss types and are made with similar cheese. Italian: The Italians make fondue with a twist, adding milk, eggs and truffles to a mix of Fontina and other cheese. Welsh: Welsh rarebit is a variant on traditional cheese fondue. Asian: Asian fondues are not so much fondues as dipping sauces. Typically beef is sliced very thin, rolled, and dipped into a meat juice. Dessert: Made from melted chocolate, dessert fondue has become very popular. Think about the kind of fondue you plan to make on a regular basis before investing in a fondue pot or set. Some pots can be used for various types of fondue, while others are specific. A chocolate fondue pot, for example, is really too small to make a main course cheese fondue. The type of fondue pots used for various types of fondue is entirely up to the chef. Most fondue pots have a wide rim and sit upon a frame that holds either a gel canister or a tea light. Modern versions include electric fondue pots that plug into a standard outlet and provide even heat. Choosing the right fondue pot depends on the type of fondue you wish to make. Chocolate fondues need the least heat, so can be melted in a lightweight pot. Cheese fondues require a heavier pot, so look for one with thicker walls. If you're making meat fondues such as the Asian fondue, seek out special fondue sets marked for meat fondues. 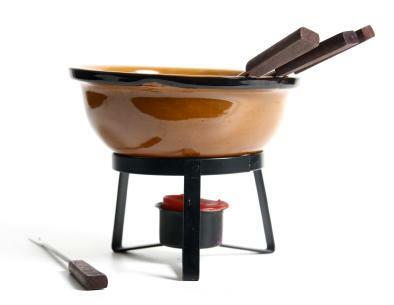 Fondue caquelons come in glazed ceramic, cast iron, nonstick and enameled cast iron pots. For cheese fondues, most cooks seem to prefer glazed ceramic or cast iron. The Swiss, considered the experts in the art of fondue, prefer a glazed ceramic fondue pot and traditional candle or gel canister light. Fondue pots for chocolate fondues are the smallest and least expensive. You can find a starter set to make dessert or chocolate fondue for as little as $20. Cheese fondue pots are considerably larger since the fondue is the entire meal. Expect to pay anywhere from $30 or more for a good quality cheese fondue set. Most fondue pots come as a set and include the pot, dipping forks, and holder for the fuel or tea light. Some will include a turntable or lazy Susan so that guests can easily turn the fondue pot around. Others provide color-coded forks so that if guests leave their forks on the table they can easily tell which one is theirs. Because eating fondue is a group affair, pay attention to fondue etiquette. Don't let your lips or tongue touch the fork since that's the part that returns to the pot; you don't want to share germs. It's also considered rude to double dip your bread or fruit in the pot. In Switzerland, the tradition is that when someone loses the bread off the end of the fork and it drops into the pot they have to buy a bottle of wine for the table. That's a tradition everyone can embrace!